Samsung has had to stop selling its Galaxy Nexus smartphone in the US after Apple paid a bond, bringing a court-ordered ban into effect. It follows a preliminary ruling that the South Korean company had infringed four of the iPhone maker's patents. Apple had to take out a $95.6m (£61.1m) bond to cover Samsung's losses should the final judgement go the other way. The Next Web reported that Google now planned a software update to its Android system to circumvent the ban. In the meantime the search giant has amended the listing for the Galaxy Nexus handset on its Google Play store to read: "Coming soon". Other US sites offering the smartphone are expected to follow. 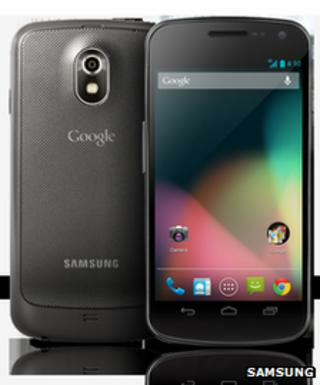 Although the Nexus is less powerful that Samsung's Galaxy S3 model, it has had a high profile. Google handed models out to developers at its recent I/O conference in San Francisco and had intended it to be the first phone to be offered the Jelly Bean Android update. Although the judge accepted all four technologies appeared to have been used without Apple's permission, the Foss Patents blog noted she ruled only the search interface technology infringement could be said to threaten "irreparable harm" to the US company were she not to grant a ban. According to reports, Google's software patch will include changes to its quick-search and voice-search facilities, limiting them to web-based results. A spokesman for Google was unable to provide the BBC with further detail. A spokeswoman from Samsung said it was disappointed US shoppers would be unable to buy its device for the time being. "We will continue to pursue an appeal of the Galaxy Nexus preliminary injunction, which we filed on July 2 to the Court of Appeals for the Federal Circuit," she added. "Meanwhile, we are also working closely with Google to resolve this matter, as the patent in question concerns Google's unified search function."